MIAMI – Seven years before the greatest free-agent coup in pro sports history, R.C. Buford had dared do something Miami's president Pat Riley could've never tried with LeBron James: All over the Western Conference, the San Antonio Spurs general manager traveled to New Jersey Nets games to make himself visible to superstar Jason Kidd. The Nets' coaches never noticed, and management underestimated the significance of the meticulous recruiting plan underway. This was old-school recruiting for Buford, out of his younger days on Kansas and Florida coaching staffs. No words were necessary, but the message was unmistakable: The best franchise in the NBA had a max-contract slot and wanted the planet's best point guard to join it come free agency on July 1, 2003. "Jason knew he was there," one Nets official says now, "and that's all that mattered." For everything that's been so methodical and understated with these Spurs, for the painstaking and resourceful way that they've constructed a four-time NBA championship franchise, they made a rare brash bid in free agency for a max-out superstar. After beating Kidd and the Nets in the 2003 NBA Finals, the Spurs stayed the course on a year-long plan to sign him to a five-year, $80 million contract. His visit to San Antonio left him breathless, an elaborate and precise recruiting pitch that spared no detail on how the next five years of his career could play out. The Nets never realized how badly he wanted to be wooed until it was too late, until Jason and his then-wife, Joumana, were emailing photos from the lavishly decorate hotel suite to Nets president Rod Thorn. "They were busting [Thorn's] chops," one Nets official remembers, "but at the time, we thought: 'Oh man, we might be screwed here.' "
Another Nets official said, "They had a five-year plan to show him and we had no plan. San Antonio rolled out the red carpet and Jersey had nothing for him. We underestimated how much he wanted to be recruited, and probably got a little arrogant in thinking that he wouldn't leave. We dropped the ball." In the recruitment of Kidd, the Spurs were walking a delicate line with Tony Parker. He had held his own against Kidd in the Finals and became increasingly irritated with the franchise's pursuit of him. He was 21 years old, had a championship now and he wanted no part of ceding control of the ball. "Our hope was to make it all work," Buford told Yahoo! Sports on Wednesday. "It was never a choice of one or the other. Jason was a unique player that doesn't require a team that played traditionally." 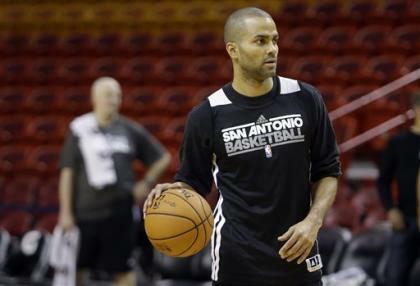 Coach Gregg Popovich planned to move Parker to the shooting guard and make him the point guard as Kidd grew older. Parker left town for Kidd's recruiting visit, but couldn't ignore the reports of Duncan escorting Kidd everywhere through Parker's town. He was enraged and hurt. Finally, he called San Antonio Express-News reporter Johnny Ludden and made his case to the public. "I know I'm the best point guard for this team," Parker told Ludden. "I can lead this team. I know deep down in my heart I can. I'm only 21, but I'm going to get better." Years later, Parker told me: "If he came here, I don't think I would be in San Antonio." Mere days removed from a championship parade on the River Walk, Kidd's visit to San Antonio sold him on signing with the Spurs. He was trading coach Byron Scott for Popovich, and Jason Collins-Dikembe Mutombo for Duncan. He delivered word back to Nets management that he planned to take the Spurs offer, Nets sources remember, and sheer panic set into the organization. Nevertheless, there was something that afforded the Nets to try to make a case: The reluctance of Joumana Kidd to leave metropolitan New York and her fledgling television career. The Nets needed something to make Kidd believe he was returning to a better team in Jersey, something to justify turning down what felt like a basketball utopia. Thorn and two of his front-office executives – Ed Stefanski and Bobby Marks – traveled to watch free agent Alonzo Mourning work out at the Overtown Youth Center in Miami. Mourning was trying to play with a kidney disease, and ultimately knew that he would need a transplant. Several teams had come through to observe him – Denver, Memphis and Dallas – but no one needed him as desperately as the Nets. Denver offered a one-year, $14 million contract, but Mourning didn't want to play for a rebuilding team on a one-year deal. Mourning called Kidd about trying to join him with the Mavericks. Dallas didn't have the cap space to sign Kidd, but the threat of walking to the Spurs could've been used as an incentive to sign-and-trade. Kidd turned it around to Mourning: How about you come to the Nets? For Thorn and ownership, an 11th-hour dinner meeting with Kidd left them little choice: The Nets gave Mourning a four-year, $22.6 million contract – much more money than Mavericks owner Mark Cuban was willing to commit. For all the drama that Joumana Kidd played in her husband's Nets career, those within the franchise understand that they owed her immensely. She wouldn't leave metropolitan New York, and her husband couldn't sell San Antonio to the family. Kidd wanted to go and always regretted passing on it. "Pop is the best," Kidd simply emailed on Wednesday, when asked about that recruitment process. The Nets re-signed Kidd to a six-year, $100 million contract and the Spurs' foray into the free-agent superstar chase turned out to be a one-and-done. Ten years later, Parker has been the Spurs best player and he'll start Game 1 of the Finals within days of Kidd's retirement. It still makes Parker seethe sometimes, but that's because he's such a tenacious competitor. These Spurs belong to him now, and the Spurs' championship core remains homegrown, developed and the ultimate contrast to LeBron James and the Heat. "I was trusting Tony's maturity and Pop's relationship with him," Buford told Yahoo! Sports on Wednesday. "We understood the way that Tony felt about that. From what's happened since, we've felt fortunate that it's worked out as it has. You can't say, 'I wish it would've worked out this way, or that way.' "
As it turns out, the Spurs never regretted missing out on Jason Kidd. Eventually, he won his title with the Dallas Mavericks – beating Miami in '11 – and that makes his choice to pass on that Spurs dynasty so far less haunting. Ten years later, it's Game 1 of the NBA Finals and Tony Parker turned out to be right: He was the best point guard for this franchise. Ten years after the failed recruitment of Jason Kidd, the Spurs' way remains unchanged and unchallenged: Subtle over splashy is forever the formula for them. • 2013 NBA Finals preview: Who has the edge? • Watch: Is Gregg Popovich as elite a coach as Phil Jackson?